This article or section contains information about a feature from a future version of Scratch that is unreleased and is subject to change. Some Scratch Blocks may not display correctly on this page. This article or section needs additional citations for verification. Its information may not be accurate. Editors can help by adding references. 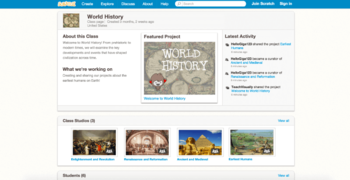 The Student and Teacher accounts are special types of accounts which allow Scratch for classroom use. They have the ability to participate in classes. Little is known at this time as they are unreleased. The teacher accounts will be released for beta testing by a select group of teachers sometime in late January 2016. Before the creation of these accounts, they were commonly suggested by teachers. These accounts were planned in 2013. The Scratch Team started working on the accounts sometime after this date. The Scratch Team revealed work on this feature in May 2015. The first class was created in July 2015, most likely for testing purposes. In October 2015, further knowledge about this feature was revealed with the public discovery of the Scratch Development server. This was followed by the discovery of more student and teacher accounts. The feature was confirmed by the Scratch Team. It's now known that these accounts have been added to Scratch, but may not be ready for the public for some time. These accounts are now more widely known among community members, and have been discussed frequently. 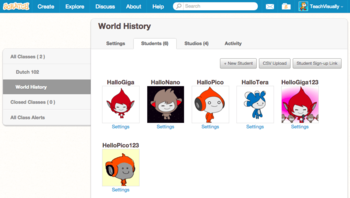 In addition, each student will have their own Profile Page. 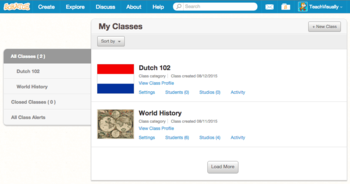 A class page can be created by the teacher, which displays the students, and class studios. This page was last modified on 13 June 2016, at 03:13.